"We'll talk in the morning." 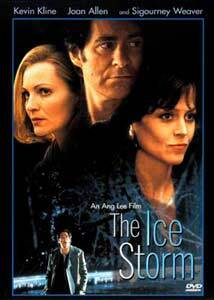 Ang Lee's film of The Ice Storm adapts Rick Moody's novel to the big screen. This 1973 period piece concerns two New England families immersed in the "Me Generation" to such a degree they can hardly see each other. The Hoods, Ben (Kevin Kline) and Elena (Joan Allen), have lost touch with each other; Ben carries on an affair with neighbor Janey Carver (Sigourney Weaver) unbeknownst to her husband, Ben's friend Jim (Jamey Sheridan). Young Paul Hood (Tobey Maguire) awkwardly pursues his school friend Libbets Casey (Katie Holmes), while his 14-year-old sister Wendy experiments with both Carver brothers, Mikey (Elijah Wood) and Sandy (Adam Hann-Byrd). When a major ice storm strikes the region one winter night, events conspire to deliver a tragic wake-up call to both families. My first encounter with The Ice Storm was in a theater where some audience members seemed to be expecting a Twister-style disaster movie. Ang Lee's rich portrait of dysfunctional family life is nothing of the sort, though it contains its share of emotional train wrecks. I enjoyed the film the first time I saw it, but found its steady pacing, subtle impact and deep resonances even more rewarding on second viewing. A fine cast imbues complex personalities with naturalism and texture. Ben Hood's jovial confidence masks deep uncertainties about his own morality, while Elena Hood yearns for excitement she's too timid to seek. Young Wendy Hood's sexuality is unsettling in its frankness and lack of emotion, less a blossoming flower than a creeping vine. Paul Hood provides a narrator's voice to some extent, observing the similarities between his family life and the adventures of Marvel Comics' The Fantastic Four. The Carver family operates less as a family than a collective, with little supervision or contact between its members. All of these characters are recognizably human and sympathetic, even when their actions are less than admirable. The titular Ice Storm is nicely realized, introducing a humanity-versus-nature element to the narrative that ultimately reinforces its central internal and interpersonal conflicts. And the 1970s context is more than window dressing—key plot points turn on sexual permissiveness and youthful drug experimentation, as a swinging "key party" exposes weaknesses in the Hoods' marriage and Libbets' tranquilizer overdose puts Paul Hood in a compromising position. Ang Lee again displays remarkable skill at adopting cinematic conventions without abandoning his own artistic intent (see Crouching Tiger, Hidden Dragon as another example). Here, he anchors the action in its era and environment without resorting to gimmickry or cliché; in fact, his "period" approach is so successfully understated that the film itself seems to have been made in 1973, rather than 1997. Carefully constructed, building its impact layer by layer with little in the way of formal plot, The Ice Storm spends intimate time with troubled people, offering no easy answers but some degree of hope. The message is universal, and well worth experiencing. Image Transfer Review: Fox presents The Ice Storm in its original 1.85:1 widescreen theatrical aspect ratio, with a solid anamorphic transfer. The source print has some dirt flecking at the very beginning, but the digital transfer is crisp and solid with naturalistic color and fine detail on the turtleneck sweaters, macramé vests, flyaway hairdos and beanbag chairs that populate Lee's vision of the 70s. Great work on this Fox Searchlight title. Audio Transfer Review: The Ice Storm is presented in its original Dolby Digital 5.0 audio format, with downmixed English 2.0 Surround and French 2.0 tracks as well. The 5.0 track is quite active, with particularly strong storm effects as winds and rain whip around the soundstage, an enveloping presentation of Mychael Danna's orchestral/shakuhachi score, and decent musical bass despite the lack of a dedicated .1 LFE channel. The 2.0 English track is heavily centered and clearly aimed at standard TV listening, though both 2.0 tracks use the rear surrounds to some degree. The French dub just doesn't work very well, despite sensitive handling, as much of the flavor of the era is lost, and the young characters sound older than they're supposed to be. But the audio sounds as clear and crisp as a 1997, digitally-mastered track ought to. Extras Review: Fox's The Ice Storm DVD features 24 picture-menu chapter stops and English and Spanish subtitles (there's also a phantom, empty French subtitle track, which may throw off some player default settings). The disc also includes the film's theatrical trailer, and five trailers for other Fox Searchlight releases Titus, Grand Canyon, Smilla's Sense of Snow, Inventing the Abbotts, and Paradise Road). All trailers are in anamorphic format with Dolby 2.0 audio, most in 2.35:1 aspect ratio, with the trailer for The Ice Storm in its native 1.85:1 format. The only real "extra" is a brief video-mastered Featurette, shot on location during the production. This presentation includes brief interviews with director Ang Lee, writer/producer James Schamus, and several of the actors. It's a serious piece that focuses on tone and character, short but a cut above the usual promo material. Ang Lee's The Ice Storm is a richly depicted slice-of-life drama set in the early 1970s, speaking volumes about the risks of self-centeredness in any context. Fox's DVD features a fine digital transfer, though supplements are limited. Recommended.